There are literally thousands of acronyms in the United States Marine Corps (USMC) and all branches of the military and there are hundreds of new terms to learn. This reference is a starting point for recruit families—those that are most important to learn during recruit training. 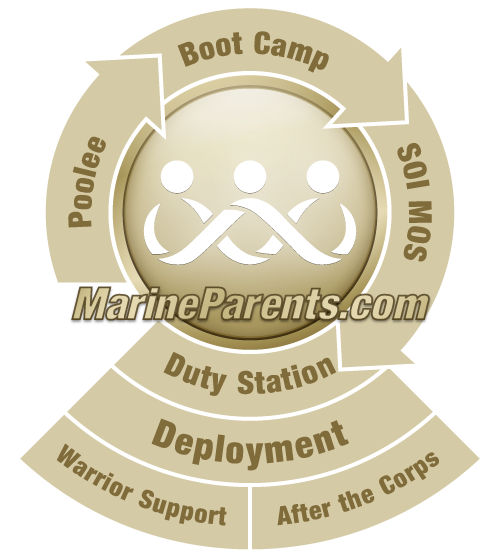 After graduation, there are additional resources with more terminology on the primary web site for MarineParents.com. But these are the most important to learn at this time. For information on the structure of Recruit Training Battalions, Companies, and Platoons click here. Marines receive classroom instruction aboard Bridgeport, California, Jan. 14, 2015. —(USMC photo by Lance Corporal Kaitlyn Klein). Semper Fi Short for Semper Fidelis, Latin for "Always Faithful"
MCRD Marine Corps Recruit Depot, also called "The Depot"
Parade Deck Graduation: ceremonies take place on the parade deck. Do NOT walk across the parade deck. Titles of Recruit Training "Jobs"
Foot Locker Recruits store their gear in a footlocker at the foot of their "rack"